A notorious bank robber kills his wife and flees the police, only to be captured by a mysterious group of figures in an abandoned town. His beautiful daughter, Lila Lee (played by the late Cheryl “Rainbeaux” Smith), receives a letter stating that Lila’s father is near death and that he needs to see her. Sneaking away at night from her minister guardian (Richard (EATING RAOUL) Blackburn, who also writes and directs), Lila embarks on a terrifying journey to find her father that leads her to a mansion run by Lemora, a seemingly loving woman who cares for a group of gypsy children and a witch-like servant. Once the terrifying secret of Lemora is revealed, Lila must uncover what happened to her father and fight for dear life as she tries to escape the clutches of the undead! 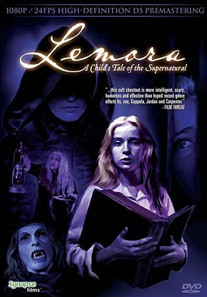 LEMORA: A CHILD’S TALE OF THE SUPERNATURAL, one of the most beloved horror cult classics ever made, makes its home video premiere with this stunning presentation from Synapse Films. Mastered directly from the original 35mm camera negatives (thought to be lost for over thirty years) and mastered in High Definition using a Spirit DataCine Telecine System, LEMORA is presented with never-before-seen clarity and detail that will leave you breathless. You may have seen LEMORA in the theatres but you’ve NEVER seen it like this!